1. Thunder on the Colorado - May 6th-8th in Smithville's Riverbend Park. Bike show, field games & prizes, live music, food & drinks, vendors, bike parade, fun ride, Miss Thunder contest, Blessing of the Bikes, church service led by Bikers for Christ, and more! 2. Kids Painting for Paws Art Show Fundraiser - May 6th, 4:30-7:00pm at the Fleming Community Center, located at 802 N. Avenue C in Elgin. The art for sale (by donation) was created by Elgin Middle School art students to help raise funds for Bastrop Animal Rescue. Admission is FREE! 3. First Friday Art Walk - May 6th, 5:30-8:30pm in downtown Bastrop. Food, shopping, live music, and of course, ART! Admission is FREE! 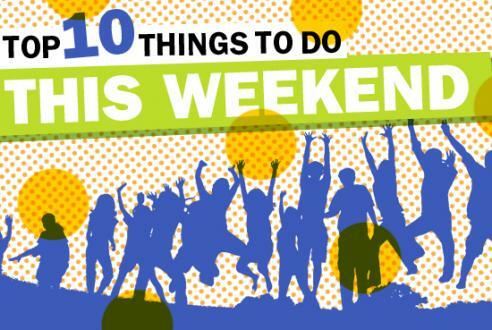 *More events in downtown Bastrop during FFAW: Drum Circle at Vibe Tribe; Night of Fun & Fashion at Liberty Glenn; Pickin' on the Porch in the Crossing. 4. Run with the Roadrunners - May 7th, beginning at 9am at Red Rock Steakhouse, located at 101 S. Lentz in Red Rock. 5K walk/run and kids 1K. Children age 12 and under are FREE! Proceeds benefit Red Rock Elementary School. 5. Tots First Tromp - May 7th, 9-10am in Bastrop State Park. Explore the old golf course trails with your little ones! Strollers are ok. Free after park entry fees. *More events at Bastrop State Park: Discover the Lost Pines Guided Hike, May 7th, 10-11am; Picnic in the Park, May 7th, 12-1pm. More events at Buescher State Park: Discover the Lost Pines Guided Hike, May 7th, 10-11am. 6. Wild by Nature Guided Hike - May 7th, 10am-12pm at Lake Bastrop South Shore Park. Enjoy an interpretive hike as a park naturalist brings together a unique blend of human and natural history to tell the story of the Colorado River. Ages 8 & up. Free after park entry fees. 7. Little Sheep Learning Center Backyard BBQ - May 7th, 10am-1pm at Bear Country Golf/Back 9 Bar, located at 834 Hwy 71 W in Bastrop. Kids' games, BBQ plates, horse back rides, petting zoo, bounce house, silent auction, raffle, and more! 8. 12th Annual Tolbert Chili Cookoff - May 7th, 10am-5pm at Ronnie's One Oak Bar, located at 816 FM 1441 in Bastrop. Categories include: Bloody Mary, salsa, chicken, beans, jr. chili, chili, ribs, and brisket. They need lots of judges, so if you're not competing, bring a hungry tummy and come join the fun! 9. Salsa Dance Night - May 7th, 8pm-1am at La Hacienda, located at 1800 Walnut Street in Bastrop. Lessons are from 8:00-9:30pm and dancing is from 9:30pm-1:00am. $5/person cover, includes lessons. 10. Yoga! in the Park - May 8th, 8:30-9:45am on the patio at Neighbor's Kitchen and Yard, located in the Crossing at 601 Chestnut Street in Bastrop. $10-20 suggested donation.